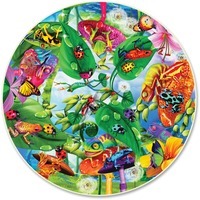 Part of the Round Table Collection, the Creepy Critters Puzzle is ideal for groups of two or more. Circular puzzles have the top of the image in the center and the bottom of the image around the entire circle so everyone has an equal seat around the puzzle. As you work your way around this puzzle, you enjoy some of nature's smaller animals in all of their magnificent colors in their magnificently colored habitat from the bottom up at every angle all living in perfect harmony for this unique moment in time. Creepy Critters was created by famed puzzle designer, Michael Searle. The 500 piece puzzle is designed for participants ages 8 and up.